Combine the pork and all spices in a mixing bowl, mixing until it reaches an even consistency. Don’t over mix. 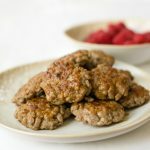 Form pork mixture into patties (8-12 patties depending on how large you like them). Heat a skillet to medium heat with 1 tablespoon of oil of choice. Cook the patties for approximately 3-4 minutes per side until browned and cooked through.